Thanksgiving and Black Friday have come and gone; holiday decorations are going up all over town - what's the most eco-friendly way to deck the halls this holiday season? The biggest concern is finding an eco-friendly Christmas tree. 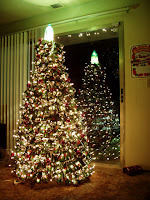 Are artificial trees better for the planet or can you enjoy the beauty of a live tree as well as a green lifestyle? Trimming the tree also deserves attention, from the ornaments and garland to the power-consuming lights. Here are a few tips to help you make the greenest choices this season. While artificial trees can be reused for many years to come, most fake trees are made with petroleum-based, non-biodegradable PVCs. When their life finally comes to an end, fake trees sit in landfills and release harmful chemicals into the soil. Live Christmas trees are typically grown at a tree farm specifically for the purpose of holiday decorating. Most are transported from local growers, minimizing the impact of shipping, and after the holidays, live trees can be recycled into mulch or composted. Real trees are generally a better option for the planet than fake trees, but many tree farms use pesticides and other chemicals during the growing process. Organic Christmas tree farms are becoming more common for an even greener holiday season. Rent a Christmas tree: Tree rental services are popping up in Canada, the US, and the UK. The potted trees are delivered to your home for the holidays, then picked up and planted after the festivities come to a close. Recycled paper trees: Small cardboard Christmas trees, along with cardboard ornaments, can be purchased online and offer a festive and crafty alternative for the holidays. Make your own tree: Recycled junk can make a creative alternative to a traditional Christmas tree, like the Mountain Dew can tree pictured here. You can also try garland and wire stems, tomato cages, or create a simple wall hanging like this adorable handprint tree. Whether your Christmas tree is real, artificial, or made out of aluminum cans, there are plenty eco-friendly trimming ideas. Opt for LED Christmas lights to minimize energy consumption. Consider bows made of fabric scraps, recycled paper chains, or strings of popcorn or cranberries in place of tinsel and garland. When it comes to tree ornaments, there's a tremendous selection of fair trade ornaments available. You can also get your children involved and create your own tree ornaments using recycled materials. We would love to hear what you're doing to minimize your impact this holiday season! Share your eco-friendly Christmas decorating tips in the comments.